Colorado Newspaper Battle Could Define What's 'Fake News' And What's Not If the Colorado newspaper files a lawsuit, legal experts say it would be the first of its kind, potentially setting a legal definition for what is considered fake news and what is not. 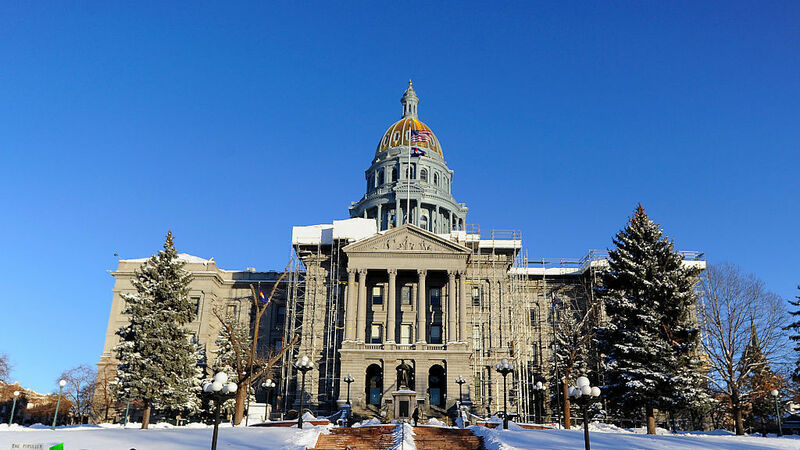 The state Capitol in Denver in December. The Grand Junction Sentinel has threatened to sue state Sen. Ray Scott after the lawmaker accused the paper of spreading "fake news." A news outlet publishes a story that a Republican politician dismisses as "fake news." Sounds familiar, right? But in this case, there's a twist. The Grand Junction Daily Sentinel in Colorado is accusing state Sen. Ray Scott of defamation and threatening to sue. If filed, legal experts said it would be the first suit of its kind, potentially setting a legal definition for what is considered fake news and what is not. The dispute began with an opinion column in the newspaper supporting a bill that would give journalists and others greater access to public records. Scott, who represents Grand Junction and serves as assistant majority leader in the state Senate, postponed a hearing and vote on the bill. The column urged him to move it forward. "We call on our own Sen. Scott to announce a new committee hearing date and move this bill forward." The very liberal GJ Sentinel is attempting to apply pressure for me to move a bill. They have no facts, as usual, and tried to call me out on SB 40 know as the CORA bill. They haven't contacted me to get any information on why the bill has been delayed but choose to run a fake news story demanding I run the bill. Scott declined an interview request on the advice of his lawyer. The accusation that the column was "a fake news story" raised the ire of Jay Seaton, the Sentinel's publisher. "I'm accustomed to all kinds of criticism for what we do; that comes with the job," he said. But Seaton says the term "fake news" is "an attempt to undermine the speaker. That's where this bumps up against the First Amendment. When you've got a government actor who doesn't like something he's seen and tries to diminish its credibility, then you've got real problems." And, potentially, a lawsuit. Seaton says he's going to cool down for a couple of weeks but is looking at his options for filing the suit, which is likely to put the "fake news" term in the spotlight, said Steven Zansberg, an attorney who has represented the press in Colorado, including, at times, the Sentinel, though not in this case. Zansberg noted that the Sentinel isn't alone in facing such accusations. "We are seeing a trend, not just here in Colorado, but that politicians for a variety of reasons have taken to calling very legitimate media entities — whether it be The New York Times, The Washington Post or CNN — fake news," he said. "It's intended to delegitimize those sources for news." Aside from whether there's a legal case against such accusations, there's the question of whether it's a good idea for a news organization to combat its detractors in court. Bringing cases like this could ultimately backfire on the press because legal arguments made in such cases could later be used against them, said George Freeman, the executive director of the nonprofit Media Law Resource Center. "Then the next time you're arguing something is opinion to win your case, maybe the court will look at this case and say, 'No ...' it's similar to this case where the judge decided it's a fact," Freeman said. Freeman spent more than three decades as in-house counsel for The New York Times. The newspaper has a strict policy against filing libel claims against detractors on the principle that the press doesn't want to suppress the speech of others. Still, Freeman believes the Sentinel is within its rights to threaten a lawsuit. "I think the line has to be set. People just can't call whatever they don't like 'fake news,' and that's what [Scott] is essentially doing." The fight between the newspaper and the state senator is exacerbated by the fact that the bill at the heart of the dispute is something many journalists in Colorado want to see become law. The legislation would make it easier for news organizations to analyze digital data through open records. The bill's Democratic sponsor now worries the measure is in jeopardy. The battle over what is news in Colorado comes as state Republican leaders are trying to improve relations with the local press to contrast themselves from President Trump, whose battle with the media doesn't show any signs of letting up. For the first time in years, Republicans are holding multiple media briefings each week and Republican senators recently hosted a reporter meet and greet. Some worry this potential lawsuit will be a setback. "There's some risk of squelching open dialogue and that's one thing I've been trying to encourage as majority leader," said Senate Majority Leader Chris Holbert, a Republican. To him, "fake news" is a relative term and the fight between the newspaper and his colleague is a sideshow. "What it means to one person might be different than another," said Holbert. "Are stories made up entirely out of whole cloth? In this instance, it seems like there are differing perspectives on the same reality. This really seems to be rather unnecessary."